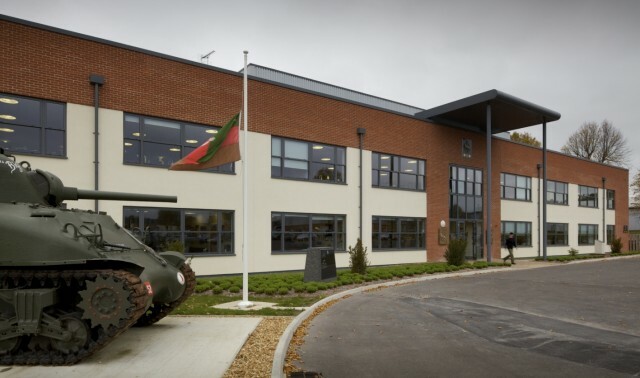 Project Allenby, Connaught, £40.5m is the redevelopment project of the Ministry of Defence (MoD) for the Garrisons in Aldershot and around Salisbury Plain. Aspire Defence Ltd is owned by KBR, Innisfree and InfraRed. It delivered Project Allenby, Connaught on behalf of the Ministry of Defence. The 35-year Aspire PFI (Private Finance Initiative) contract has a capital value of more than £1.4 billion and a life value of more than £8 billion. 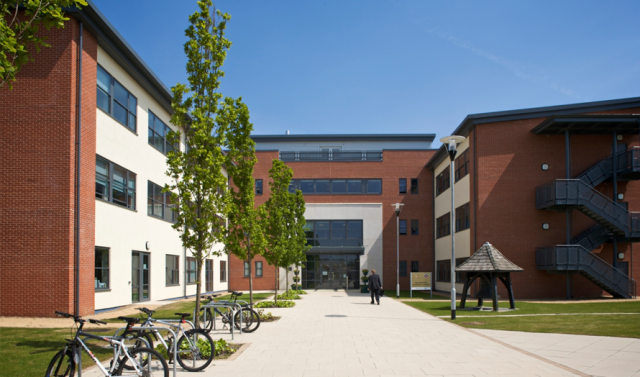 Aspire PFI is the largest infrastucture PFI contract ever awarded, combining a £1.2bn construction programme to upgrade soldiers’ working and living accommodation with long term facilities management services over 35 years. 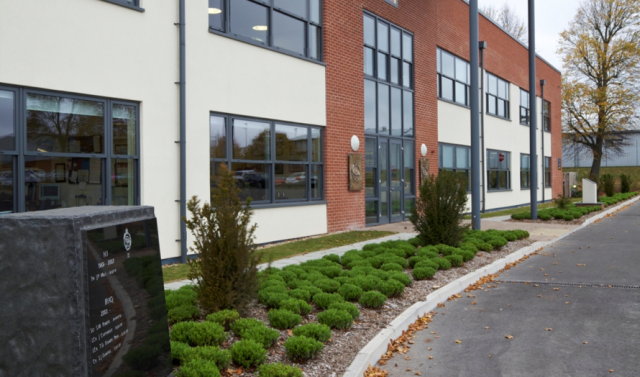 The Project Allenby is part of the Aspire PFI and provides 360 new buildings and 155 refurbished buildings over a nine-year construction period to achieve a modern living and working environment, with associated support services for some 18,000 personnel. 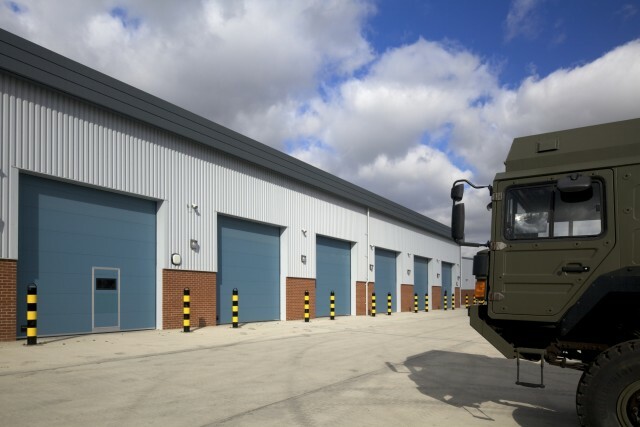 Over the past 10 years, over 60 technical buildings have been designed, built and accepted into service with the MoD. In the same period, 84 technical buildings have been refurbished or altered with 4 currently on site. Thus 145 buildings have been designed and at any one time up to 14 projects would be in various stages of design. We have undertaken detailed building surveys in order to record structural defects and imminent repair works in advance of the refurbishment and alteration design proposed for offices, workshop, training and storage buildings. The purpose of the surveys was to visually determine the structural form and condition of the buildings to inform the design for refurbishment or alteration to accommodate change of use and/or enable the long term serviceability of the buildings. All of the surveys were conducted on buildings in occupation or use. CampbellReith designed seventeen office buildings for MoD. The buildings range in size from 390 m² to 5500 m², and they provide troop, squadron, regimental, battalion or divisional office accommodation. The buildings are all one, two or three storey steel framed structures. The upper floors were formed from insitu reinforced concrete slabs with fabric reinforcement with a floated finish, screed (incorporating under floor heating pipes) and insulation, on permanent metal formwork. Six training buildings ranging in size from 300 m² to 1250 m² were designed to provide training spaces. Most of the buildings are two -storey structures and have associated offices, workshops and storage buildings. Whilst looking cosmetically the same, these associated buildings have variations in terms of area or handing. Most of the training buildings have lecture theatres attached. They also have direct classroom entry at ground level to allow for access to training vehicles placed outside. CampbellReith designed twenty storage buildings ranging in size from 100 m² to 3100 m². 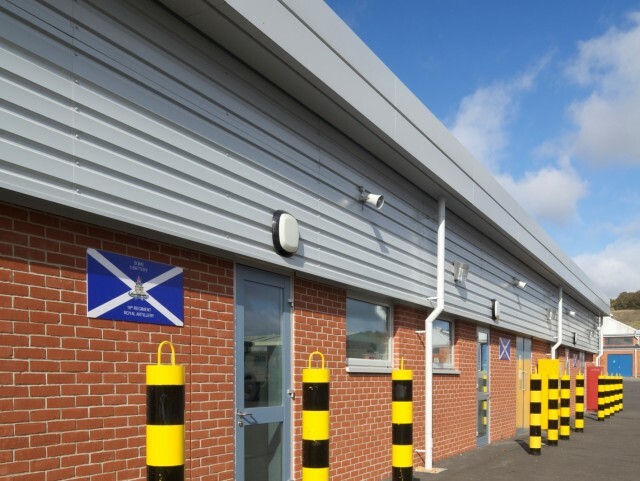 These buildings, with associated office accommodation, provide storage space for a host of technical and unit requirements. The buildings were generally of single storey steel portal framed construction braced, in two directions. Steel rafters supported proprietary standing seam/composite roofing to Architect’s specification on cold rolled purlins. Typical spans of the buildings ranged from 8 m to 21 m.
Ranging in size from 500 m² to 3575 m², the workshops were required to provide workshop and servicing facilities along with the associated office and storage accommodation for a range of specialist, technical and unit requirements. The building form was similar to the stores building but the spans were generally greater ranging from 13.5 m to 30 m. Four of the buildings also had to cater for overhead travelling cranes capable of lifting 10 tonnes.